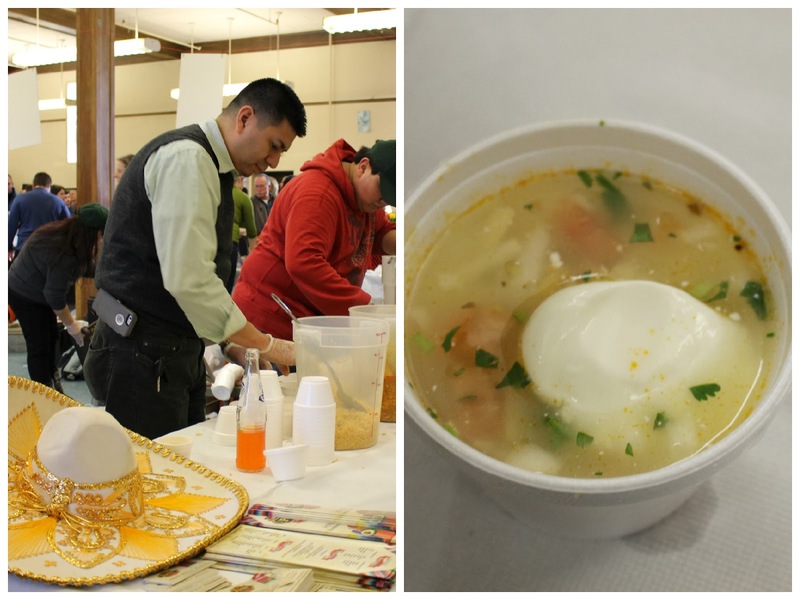 Every year the Mo and I go to the Lowell WinterFest North Bowl Soup Competition at the Masonic Center on Dutton Street. "There's a lot to like about Lowell!" The WinterFest being one of many reasons to like Lowell! The competition used to be held both Friday and Saturday night but this year it was only available on Saturday between 1:00 PM- 4:00 PM. Admission price stayed the same at $5.00 per person at the door. Since we had a late breakfast, we arrived towards the end of the event, yet there was still a line to get through the door! The crowd ranged from toddlers to the elderly and every age group in between. Everyone loves soup! The air was filled with tantalizing aromas as the contestants quickly filled up their soup cups to move the lines. 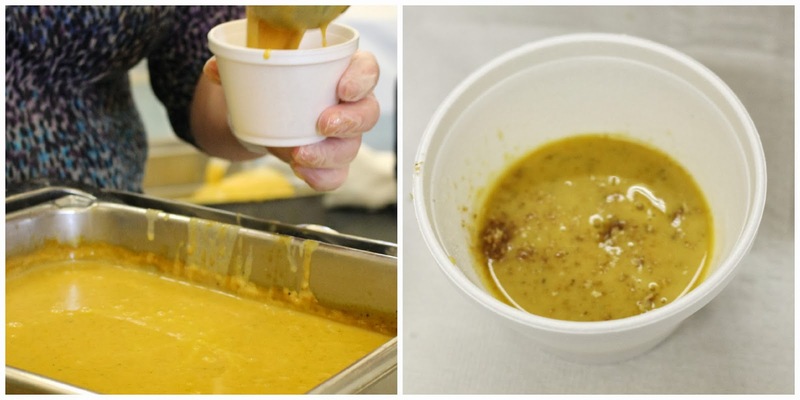 The restaurants sponsors the competition by donating the soup to promote their local business. First up, we headed to the 2 Asian establishments. Eggroll Cafe, located by UML North campus, makes amazing eggrolls, Bento boxes and bubble tea. They served their yummy chicken curry as they traditional do every year. I did miss the crab rangoon eggroll this year. Tephida Khmer Restaurant on Chelmsford Street served a traditional Cambodian pineapple & Lemongrass Soup known as "Som Law Kati." I give them credit for bringing something "Global" and unique to the competition but I don't think it's the route I would take if I was looking to win a competition. I would try to come up with a soup that would please all taste buds. There were a few bland soups, I didn't care too much for Sao Miguel Restaurant Portuguese Kale Soup or The Radisson Hotel's Beef and Ale Soup. It's like, "Did you even try taste this when you made it?" There were a couple different chowders. I didn't get a chance to try the Boys & Girls Club of Greater Lowell. I really liked TJ Callahan's Pub Southwest shrimp and corn chowder. 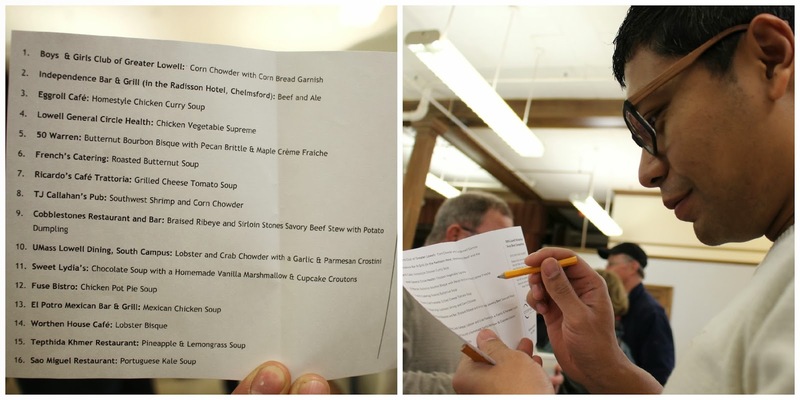 My favorite chowder was Umass Lowell's Dining South Campus Lobster and Crab Chowder with Garlic & Parmesan Crostini. The soup had large chunks of lobster and crab in each bite. Cobblestone's Braised Ribeye and Sirloin Stones Sabory Beef Stew was pretty unsavory and lacking. It was disappointing this year because I love Cobblestones and was really excited for their soup. Ricardo's Cafe Trattoria Grilled Cheese Tomato Soup was rich and creamy but as little on the tangy side. I think I would have liked it a little bit better if the server didn't add so much Parmesan cheese to the cup. El Potro Mexican Bar and Grill served a Mexican Chicken Soup that required an assembly line to scoop rice, add pico de gallo and broth and top it off with sour cream. The soup was full of wonderful flavors and textures but it was COLD! It wasn't meant to be a chilled soup and the temperature turned me off. Lowell General Circle Health's Chicken Vegetable Supreme was very tasty and flavorful. I would have voted for this soup if it had not been on the salty side. I needed to drink water after my tasting. 50 Warren Butternut Bourbon Bisque was very good. I felt a little guilty as I sampled it. It was like I as sipping on melted butter with pecan brittle with booze. French's catering also served a roasted butternut soup that was just OK.
Fuse Bistro's Chicken Pot Pie was good. Lastly, there was a "Dessert" Soup. 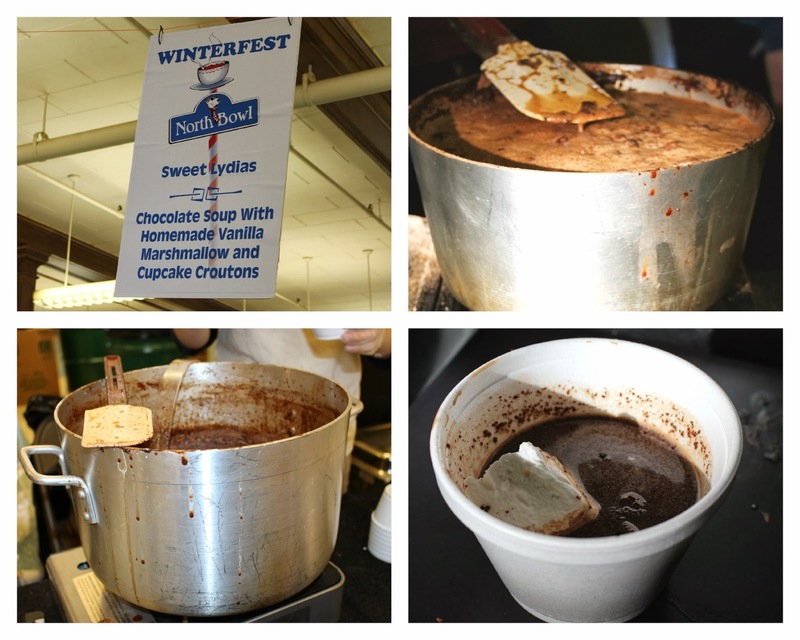 Sweet Lydia's served a chocolate soup with a homemade vanilla marshmallow & Cupcake Crouton. It pretty much was a hot chocolate. It was definitely different and tasty but its not the conventional soup that I am used to. We were stuffed after sampling all those soups. SPOTTED, Baby Koli dancing on stage to the guitar player. Time to fill out the ballot! Only one vote per ballot allowed. 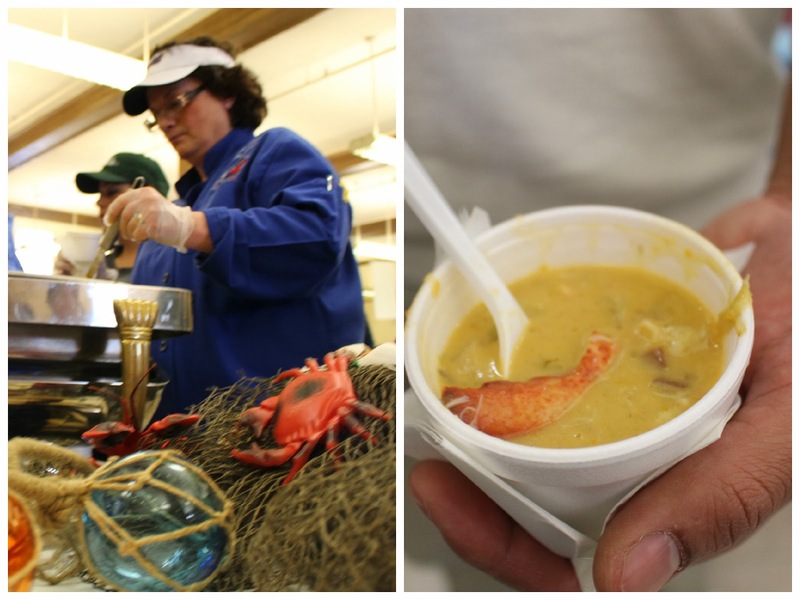 Both the Mo and I voted for Umass Lowell's Lobster and Crab Chowder. We headed outside to watch the end of the Human Door Sled Competition. Marshmallow sticks were available for purchase and patrons toasted them on the open charcoal flames. 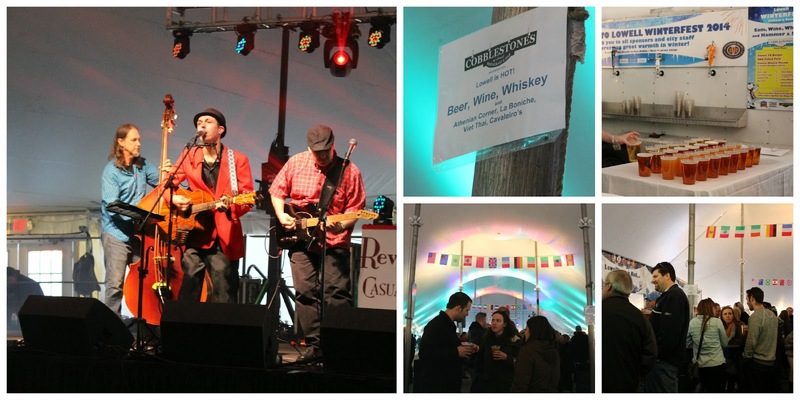 The heated Club Celsius tent featured a band and had food and drinks available for purchase. It was a beautiful day to get out of the house. We haven't seen 50 degree weather in a long time. Most importantly, it was a cheap outing!